Exercise and MS can work for people who do mild to moderate workouts with low stress on the joints and a low number of repetitions. 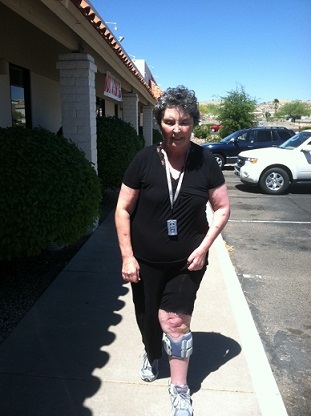 There are many myths out there about MS. Let's get to the heart of the facts about What is MS? MS affects the central nervous system. In basic terms the myelin sheath which covers our nerve cells is attacked and this creates a buildup of scar tissue (sclerosis) - that interrupts the nerve signal messages that causes a host of neurological problems. Regular exercise can help reduce fatigue in people with MS.
As little as 15-30 minutes of walking outdoors or in a pool 2-3 times each week can help with the symptoms of MS. Pick an exercise you enjoy and do it in 10 - 20 minute sessions. The rating of perceived exertion for each individual will vary, but should be fairly light to somewhat hard. On a scale of 1-10 that would be a 5-7 effort. Resistance training proves to be just as effective as aerobic exercise in producing benefits for people with symptoms of MS.
Pilates exercise is a perfect compliment for people with MS as it involves using spring loaded equipment (low impact) and a low number of repetitions over a short but comprehensive workout. I will list some of the exercises that I use with my MS Patients below. The Pilates Bridge or hip lift as some call it is a great way to strengthen your core muscles, glutes, hamstrings, open the hips, and decompress the spine. This is my go to move for a great warmup or cooldown. 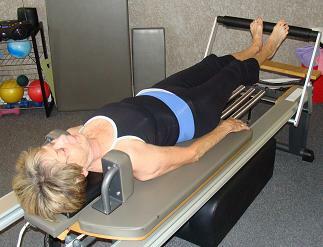 Pilates footwork can be done as shown, lying on the Reformer or sitting up on the Wunda Chair. Either way it is a great way to strengthen and stretch the muscles of the legs feet and ankles while being low stress on the joints. Using the exercise ball, as shown is a great way to improve balance, body awareness, and flexibility in the spine for people with symptoms of MS.
You can begin just turning your head and then add the whole upper body. 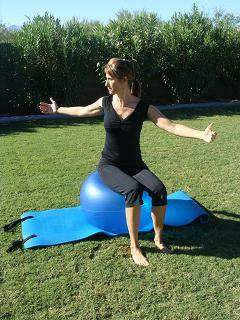 Try marching while seated on the ball. Upper body pulling exercises such as this one help to open the chest and strengthen the muscles of the back for better posture. 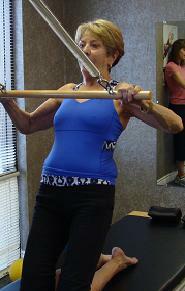 With better posture and core strength we can improve our balance and walking ability. 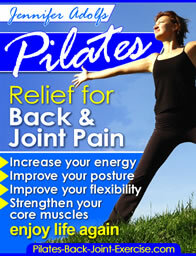 Leave Exercise and MS and find out more ways Pilates exercises can help with your back and joint pain or just anything.